A Piece of Me - I love NATURE and UST MC! 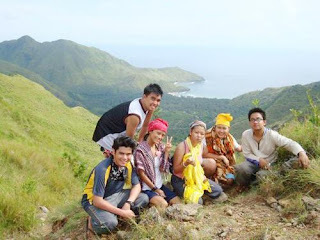 My previous trip to Anawangin, Zambales with my college friends had brought back so much memories when I was still active in my college org --- UST Mountaineering Club. I remember the first day I signed up for UST-MC. It was recruitment day for most of the organizations in UST. Tin and I had always wanted to join an org where we could discover and appreciate nature in a more intimate level. So one hot day as we were walking in the College of Commerce groundfloor hallway, we saw the UST Mountaineering Club recruitment booth. We were just talking about joining an environmentaI group earlier then there they were just like an apparition. Haha. So we signed up not knowing what's in store for us. We also found out that one of our classmate Chela signed up. That's where the 3 of us (Tin, Chela and I) got really really close up until now. :) Anyway, we attended the 1st assembly in the Educ building. We were 3 ecstatic freshmen in the educ hallway, half-shy to the unfamiliar faces who welcomed us. So the assembly started, and boy was it soooo much fun! There were teasings, stand-up comedies, screaming, laughing and a lot of smilings. In some way, we felt at home. Before every climb they conduct a diagnostic run to see if we applicants are fit for the climb. If you think it's easy you're dead wrong. We were required to run around the UST quad for about 10 times (?) with a time limit AND there are members guarding us (if ever we resort to cheating which we did once haha). And who would ever forget the hardest of them all, our diagnostic run in UP where we were required to do 4 laps around the WHOLE campus (it's running around the outside of entire school) plus2 or 4 laps around the sunken garden to be completed in 1 1/2 hours (i think). So to cut the story short, we didn't pass. Hahaha! But we had a make-up diag run just around the whole UST campus and that we passed (magically hmmm bakit kaya haha). Our first climb was in Mt. Batulao, Batangas. First-climbs are always the easiest ones. And so we thought. It was f*@cking hard (for beginners like us!) and it was almost a half day trek/walk. It's when while you're trekking you would see the mountain summit within an arm's reach only to find out after 2 hours that you're still not there. Hahaha! Talk about false hope! Then there's the "talahib" that without your long-sleeves, gloves, and j pants will definitely scar you. And so we walked, and walked, and walked. In close dehydration and heat stroke we climbed rocks and mud towards the summit. I was sunburned, thirsty, euphoric and tired. Then I saw the view from the top. And it was breathtaking. Divine. Amazing. For the first time in my life, I was in total awe. We took pictures then we sat on the edge to quietly savor the moment and the view. Then I thought, all the hardships, pain, shortness of breaths, 5 seconds pass out, heatstroke, bruises, callouses and muscle aches I obtained & experienced to get to the top, were all worth it. Sooo worth it that I wouldn't trade anything for this (or that moment). And for 1 year as an applicant (it was that hard to be an official member!) we were able to climb I think 5-7 more mountains. My favorite of which is Mt. Makiling 'coz although the trek was hard due to the sudden cliffs, slippery ground, semi-rock climbing, and the annoying posion ivy plant (which was painful! ), it was not hot which was great. It's also where our skills were tested since it was stormy at the summit! So drenched in the rain and freezing to death we pitched our tents and succesfully did amidst the deadly wind. And though there was a slight flooding inside our tent we still were able to get some sleep, enough to get some energy for the long walk home the following day. And like our first climb, the experience and the view was also amazing. If I have a favorite then I also have my hated mountain, and it's Mt. Tapulao in Zambales. Tin will definitely agree with me! (shiela wasn't able to experience the wrath of this mountain since it's her debut party hehe). It was hell, literally. It was scorching hot!!! Imagine a rocky dirt road that is 15-20 feet wide under direct broad sunlight. We trekked the same hot road for about 5-6 hours. It was the only mountain that made me cry! Kahiya! But i'm not the only one! hahaha nandamay. Out of frustration, pain, boredom, maximum dehydration and fear of heatstroke, under my umbrella I cried. Hahaha! Then the road suddenly changed, from hot dusty rocks, suddenly there were pine trees and it got cold. Weird! In conclusion, it was the most extreme experience I ever went through in mountain climbing but it still was amazing. The view from the summit was breathtaking and it again washed away all the negative emotions I felt earlier, making me feel only happiness. Every mountain we climbed was unique. Mt. Batulao, Makiling, Daguldol, Malasimbo, Tapulao, Pundaquit + some more I can't remember anymore..Each one of them possess distinctive characteristics that tests our abilities & makes every experience worthwhile. Nevertheless, each one of them makes me appreciate more the beauty of God's free gift to all of us that is NATURE. Aside from our usual climbs we also had extra activities such as rockclimbing, beacheneering, BMC's (or basic mountaineering courses) and fun parties! Hehe. We were one family with the same passion. And in spite of our absence (hehe), we still are. And as long as our passion with nature (and extreme sports!) is still there, we will forever be bonded together. Aside from strength, discipline and motivation which were just some few things we gained in MC, we also gained friends. And that for me is the most important thing. Tin, Chela and I became the "powerpuff girlz". We became part of the amazing B2K (or batch 2000) group. And the rest was history. And that brings me back to our Anwangin trip 2 weeks ago where our skills in mountaineering were once again tested; tent-pitching, cooking with the use of a burner and a cookset, bathing in front of other people (using a poso haha), reuniting with our malong and scarves, reuniting with my blue bag (which was my constant companion in my previous climbs 6 years ago), trekking+heatstroke, drinking from the batis! hahaha! I am glad I joined that trip 'coz I finally got to reconnect again with friends and I finally got to find a piece of myself that I lost in this busy world.